I’m going to tell you a secret. I have gotten very lax when it come to vegetables. I know I should “Strive For Five” and all that but it is not happening. It’s not that I don’t like vegetables. Why just recently, I discovered that leeks are perfectly lovely and I’ve learned to love beets. I think I just get tired of having the same vegetables the same way all the time. And I can’t very well pretend that french fries represent the kind of vegetables that I should be consuming on a regular basis. I want to be better. But I think I need some help. So tell me, how do you keep from getting stuck in the same old, same old vegetable rut? BAH Note: When I eat roasted cauliflower, I could almost swear I was actually snacking on fries. I think it has to do with the oil and salt and the texture once the cauliflower is roasted. It will never be as good as fries but it’s a compromise I can live with. Heat your oven to 400 degrees and line a half sheet pan with aluminum foil. Combine the cauliflower, oil, ancho chili powder, and salt in a medium bowl or directly on the prepared sheet pan. Arrange into a single layer on the pan and roast for 30 minutes or until the cauliflower is tender and well browned. I love roasted cauliflower too. I usually chop up some onion and garlic and throw that in the pan too. So delicious! I came to my cauliflower love late in life (like, last year-ish?) but now I am making up for it. I may like them mashed even better than potatoes. As for your veggie rut question, I’m not much help. It’s a lot easier to try different things in the summer when the farmer’s market is bursting with goodies. This time of year my rotation features a lot of frozen sugar snap peas and sad winter salads. Sweet potatoes are a nice change up now and then and so good for you! Jennifer, I never thought to add some garlic cloves to the cauliflower. Must try that. I usually eek through winter with roasted butter nut squash and sweet potatoes but for some reason haven’t been giving them much love lately. Love this idea – we have roasted cauliflower before, but never thought about using the ancho chili powder! We are huge veggie roasters 🙂 Another favorite is roasted broccoli – we saw it done when watching Barefoot Contessa, it really is tasty, especially since she added some parmesan at the end. Joanne, the chili powder really gave a nice smoky flavor to the cauliflower. I want to love roasted broccoli but we’ve never really connected. I think I’m probably the only person in the universe who isn’t a fan. Lan, thanks for also suggesting adding some parm to the cauliflower. I don’t know what it is about this winter but I am definitely not meeting my veggie quotient. We both need to get our groove back. Jenna, maybe my problem is more that I’m stuck with the same old vegetables and I need to expand my horizons. Except that I refuse to eat kale or chard. For instance, last night I had planned to make mashed cauliflower to go with flank steak and caramelized onions. Only I ran out of time to the do the cauli and had to throw my mushrooms into the onions because there was no time to do them in the oven. It’s hard for me to stay on top of my veggies this time of year, too… I do much better when we have lots of great veggies in season. This roasted cauliflower looks great, though… I’m thinking it will be a great way for me to get back on track! Jen, roast cauliflower is a lovely way to ease back into veggies. And just think, soon spring will be here, asparagus will be in season, and we can shed these dreary winter blahs. I love the sound of this! I simply cannot wait to try it. Sadly, I read it AFTER coming home from my weekly trip to the produce store, and while I was there I decided to pass on the cauliflower. Now I wish I had picked up a head. Next week, though, next week for sure. Jacki, sorry that you didn’t see the post before you went to the store. But now you have spicy roasted cauliflower to look forward to next week. Hope that you enjoy it. I always eye the cauliflower but usually end up bagging something I’m more familiar with. 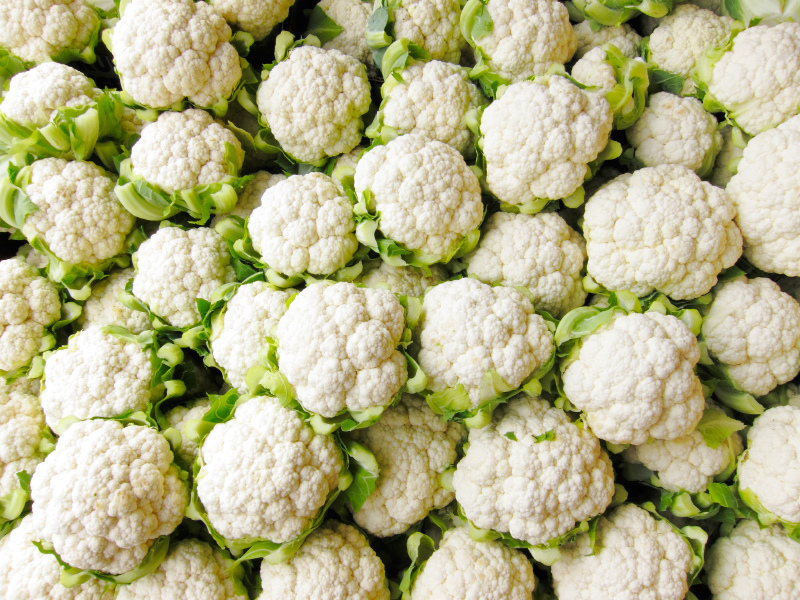 Growing up, cauliflower only made an appearance in the raw, usually in salads (which turned me off big time.) I think I just needed to find a way to prepare it – and I think this recipe might be the ticket. Ali, perhaps roasting is exactly the method you need to properly enjoy cauliflowery goodness. I have memories of eating it raw with ranch dressing but this is by far my favorite way to enjoy it. I love to use roasted cauliflower in a salad with argula, some kind of nut or seed, and olive oil and lemon. I’ve been buying vegetables I haven’t had in a while to shake up my vegetable routine. Roasted fennel is really delicious, and I’ve been eating red peppers lately in addition to my usual winter broccoli and greens. Jen, interesting that you should mention fennel. I’m not really sure how I feel about it…the whole black licorice flavor is not something I’m warm and fuzzy about. But I’ve used it in soups and braised lentils and enjoyed it. I think this recipe will meet a need this week. I love cauliflower and am always looking for new ways to prepare it. Did you see Food and Wine a few issues back? They grilled it like steak…oh my! Grilled cauliflower you say Kristin? You’ll have to excuse me while I go google that because I am intrigued. Anna, I LOVE mashed cauliflower. I’ve got a new recipe for it that I’ve been meaning to try that uses greek yogurt to give it more of that mashed potato feel. Hopefully I’ll have my report posted soon. You should give roasting a try…you might go from thinking that it’s not half bad to really liking it.